Mercury turns retrograde in Taurus on April 10th right around midnight to stay retrograde all the way till May 3rd, where it turns direct once more, this time in Aries. (Mercury retrograde straddles two signs this time, so there will be a definite change of atmosphere when Mercury changes signs on April 20th!) With Venus retrograde as well (until April 16th), the next few weeks is no time to make important decisions. We cannot emphasise this enough! You might feel under pressure - especially with Jupiter square Pluto raising the stakes and pushing you to make changes in your life. But don’t jump the gun! As it happens, both Mercury and Venus normalise their course around the same time - May 18th-20th - so you’re best off waiting till mid-May and after to sign on the dotted line. Use April 10th-May 4th to problem-solve. Then stay open to see what flies through the window from May 3rd onwards: brilliant, surprising solutions and opportunities could present themselves! Once all this is in place, you’ll be in a much better position to decide what’s what. As with all Mercury retrograde, you can expect the return of past lovers, work-colleagues, arguments, places and faces. Use this period to tidy up unfinished business. Review, revise and reconsider. Then move on. No use staying stuck in the past! The future beckons! How does Mercury retrograde affect your star sign? It’s all in your horoscope - and to err on the safe side, read your Ascendant sign too!. If you’ve bumped into a recurring problem that you just can’t face alone, why not give our experienced psychics a call on 0207 111 6384? It pays to have someone on your side who can see the bigger picture. April 10th to May 3rd is an important period of recalibration for you. It might all begin with a financial matter that you need to revisit and reevaluate your priorities. The matter soon becomes personal and April 20th onwards could put you on tenterhooks or even cause a crisis of identity! This is a very important period for you especially if you’re born April 14th-20th. Don’t jump the gun, especially in early May! Mercury turns retrograde in your sign making this April a very important month for you - especially if you’re born April 20th-26th. It’s time to revisit past decisions and see if you want to make any tweaks and changes to your overall appearance or the way you engage with the world. Then, after April 20th, a very uncertain but also very creative period begins when you can release the past. Has something run its course? You might not realise this yet, but it’s time to address issues that have been dragging on fruitlessly for some time. This might even revolve around a health matter or a psychological hangup. You may want to withdraw from your usual activities for most of April as a result. But the excitement picks up again after April 20th when you could have an exciting reunion with old friends! This Mercury retrograde period helps you recalibrate your sense of direction and your place in the world. It may start with you reconnecting with old friends or reviewing an old dream for its viability. But soon you start questioning where you’re headed in life. What professional image do you want to project? Who do you want to be? There are some thrilling ideas percolating around! Where is your life headed, dear Leo? It’s time to review your goals for relevance. This might involve an important relationship: is it going somewhere? If not, it’s time to open yourself up to something new. Or it may involve your career. If you’ve boxed yourself in, get ready for some exciting developments to take place at the start of May that will change your view on what’s possible for you. This is an especially exciting period if you work in media! Mercury retrograde in Taurus (till April 20th) is a happy time, when you can let your mind wander. You might take a holiday, visit your old Uni and remember more carefree times. It’s a good period to problem-solve anything involving publishing, the law or academia. After April 20th you enter a more emotionally (and financially) intense period when you can make rapid changes. It’s a transformation process that you won’t believe until it’s completed mid-May! This is a crucial period of recalibration when it comes to an important relationship. If you’re recently single, it gives you time to review the situation, decide if it’s worth getting back together or if you can trust this person again. Find out how to win back your ex or gain closure depending on their star sign! If you’re in a relationship you may want to review your set-up and joint finances. Late April - early May brings unsettling developments that can nonetheless help you break new relationship ground! April 10th-20th is a good time to review an important relationship or a potential partnership - especially if you’re born October 20-26th. You might come across an ex or, if you’re single, you might be unable to stop yourself from mulling over a past affair. Things get more stressful but also more interesting from April 20th onward when potentially exciting lifestyle changes are in store. What are the biggest relationship threats of each star sign? April 10th-20th finds you dealing with practical matters and trying to decide the best way forward. It’s an excellent time to problem-solve when it comes to a work project or how to improve your health and diet. The game changes from 20th of April, when you could run across a past love and rekindle an old love affair or creative project. This soon leads to you rethink what it takes to make you happy. Mercury retrograde in Taurus (April 10th-20th) could be a happy time for you. Here we have the quintessential ‘old lovers return’ or you might rediscover an old favourite hobby. If you’re working on a creative project this is the time to hit pause and carry out a careful review. Late April-early May places the focus on the home front, where chaos might reign but also where there's the potential for positive change! Fancy re-arranging the furniture? Or maybe you’re thinking about remortgaging? Mercury retrogrades in your home sector and you’re either thinking of changes to your abode, or you might take a trip down memory lane. Communications go haywire late April-early May and however crazy that is, it flicks a switch, bringing genius new ideas to you! 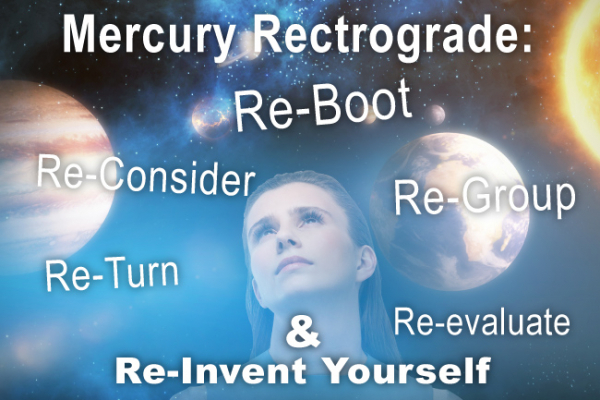 For classic Mercury retrograde blunders check out Mercury retrograde and world events!